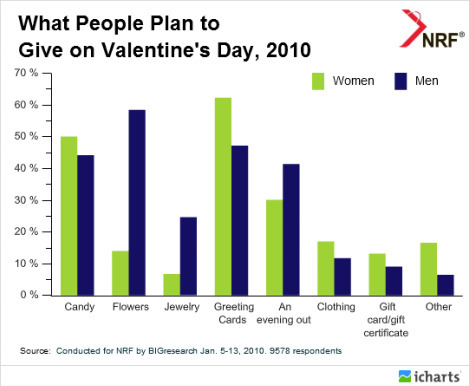 According to a survey on Valentine's Day gift giving, overall Valentine's Day spending is up 50 cents, but the average gift people are giving to their significant other is down almost $4 from 2009. Even though this brings Valentine's Day gift spending down to the levels we saw in 2004, ladies will still make out better than their male counterparts, as men on average will spend double what their wives or girlfriends will. The survey did find good news for friends, co-workers and pets though, as Valentine's Day spending is reportedly up for all of those categories, perhaps as individuals wary of pinching every penny. Although we wouldn't recommend spending more on Fido's Valentine's Day gift than on your wife's. With spending down this year, experts, both at the National Retail Federation and at the deal site CouponShack.com, are predicting that personalized gifts will be big in 2010, even as the majority of men and women stick with the age old gifts of flowers, greeting cards and chocolates. As a former "broke college student," I can attest to the power of personalizing a gift when money is an issue. This year, my wife and I are planning a dinner at home instead of trying to get into a crowded and inevitably rushed local restaurant on Valentine's Day weekend. That said, I still may have to get in on one of the personalized gift ideas that CouponShack.com included in its, 12 Tips for Valentine's Day on a Budget post. Personalized Photo Book: Go through all those photos you have on your computer or on Facebook and create a photo book to share with your loved one. I suggest using PhotoWorks or Snapfish. Both almost always offer coupons like the 20% discount being offered right now. Personalized Candies: Give your Valentine candy with his or her name on it or include a personalized message. With My M&M's you can write that personalized message (2 lines, up to 8 characters per line) on each M&M. Right now you can get 15% off. Make Dinner: Check out the Food Network for some great Valentine's Day recipes. Don't forget to print grocery coupons to take with you to the grocery store! If you still need some help becoming a Casanova or finding the best gift for your man on a budget, stay tuned to WalletPop, especially our own Bargain Babe, for great tips on getting more for less on Valentine's Day and all year!